For day 2 of Red & Black Week, a tutorial on making a pixie (aka handkerchief hem) skirt. 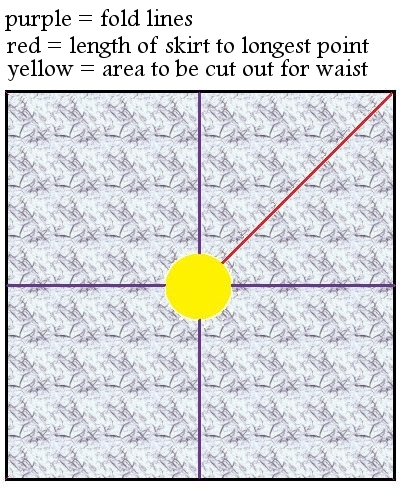 To cut the circle, first fold the fabric in half horizontally, then in half vertically (as shown by the purple lines), resulting in a smaller square. The width of the fabric will determine the maximum skirt length that you can achieve without stitching together pieces of fabric. The project illustrated here uses 60" wide panne velvet. To make the longest skirt possible, I kept as much width as I could. I just trimmed the selvages, resulting in a 59" width, and then cut the length to a matching 59". When folded horizontally and then vertically, the square measures 29.5". You can cut a square and then fold it, or you can fold the fabric and then cut it into a square. The latter is easier if you're working with a large piece of fabric. Next, make your waistband (via the same process as shown in yesterday's post). It should be 4" wide and long enough to fit around your hips. I made a 42" waistband for this project. You've determined the length of your waistband (42" in this project). Now you're going to cut a circular opening to fit that waistband. BUT before you cut, you need to account for stretching. The circular opening always stretches, and you can easily end up with an opening that's too big for your waistband. To compensate for the stretching, deduct about 2" if you're using a woven fabric and 4" if you're using a stretch knit fabric. This project used knit fabric, so I deducted 4" from my 42" waistband to get 38". This new measurement will be the circumference of the circular opening. Now, to cut the circle correctly, you need to calculate the radius. 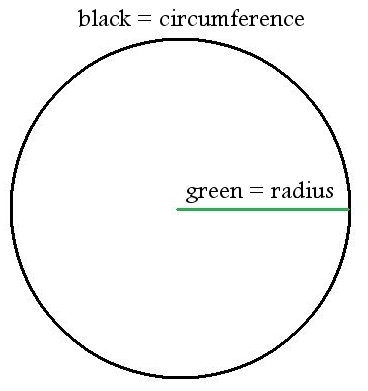 The formula is radius = circumference / (2 x pi). Pi is approximately 3.14, so 2 x pi is 6.28. 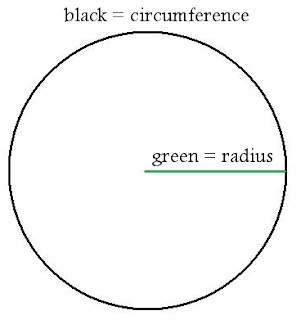 Thus, the formula is radius = circumference / 6.28. In this project, the circumference was 38", so the radius = 38" / 6.28, or 6.05". We'll round this to 6". Next, use the radius to draw your cut line. You can mark directly on the fabric, but I prefer to make a paper template which can be reused. Measuring from the corner of the paper, mark your radius (6" in this project) in several places. Then connect the dots to form an arc. This will be your cut line. Cut along the line to create the paper template. Then place the template over the folded corners of your fabric and cut the fabric along the template. Next, cut additional layers if you want, and use the template to make the waist cutout on each. These layers can be the same size or a different size(s) than your first layer. In this project, I cut a smaller (18.5" when folded) square of red fabric for a top layer. Arrange your layers as desired, lining up the waist cutouts. Pin the layers together. If your fabric ravels easily or is stretchy, slippery or floppy, you may want to baste the layers together. This project used panne velvet, which is stretchy, slippery and floppy, so I went so far as to serge the layers together. If you do this, be sure the serger knife barely skims the fabric; you don't want to enlarge the opening. Attach your waistband (via the same process as shown in yesterday's post). If the opening is a bit too small, you can stretch the fabric to meet the waistband. If the opening is much too small, you can cut it larger... but cut a tiny bit at a time. You can't shrink the opening once it's cut. Run the elastic through the waistband. If you have multiple layers and/or heavy fabrics, be sure to use elastic that's strong enough. I used 1" non-roll elastic for this project. Finally, hem/finish the bottoms as desired. Done! It takes a while to describe the process, but once you have a template for your waist cutout, pixie skirts are easy and quick to make. They're the perfect style for multiple layers of lace or sheer fabrics. Oooh, I fancy trying this! I'd love to do it with tonnes of short layers, but I love the simplicity of the colours and the fabric at this length. I'm going to have to have a go at one of these in some kind of floaty fabric for the summer! Mad props on the math. I know I am a freak, but I LOVE MATH. I don't love math like I love words, but I find it interesting. Math gets a bad rap... which is perhaps why math-oriented jobs pay well. I considered becoming an actuary but there are few jobs here. Colorado doesn't have many natural disasters. Wow, that is gorgeous! You are so very talented! I really hope you finish out the rest of Red and Black week, because I am eager to see what else you come up with! Thanks! I want a gauzy one, too. Perfect for summer! Very cute, when I finally get my hands on a sewing machine I might try this out. Awesome! I've been wanting to make pixie skirts and this helps a bunch ;) Thank you Miss Bane! The fabric chosen looks so good together I really love it! I must try making a long one. But I need to finish my "getting rid of clothing that doesn't fit" project first. Thank you! I'm doing a big closet clear-out myself. I have pulled out about 40 items so far. what a great idea. thanks for the informative post! Seriously? It's THAT easy??? Why did I never know this? Lol. Oh, except the math... But you even made that easy by summarizing the formula at the end. ;) And the end result is So Gorgeous. Thank you! The soft drape of panne works well with this style. Hmm I always called them faery skirts, close enough I guess. If I wanted to make more pointy bits at the bottom, could I cut triangle shapes out of the corners, so that there were more points hanging down? To get more pointy bits, you can make several squares and stack them on top of each other so that the points are staggered. 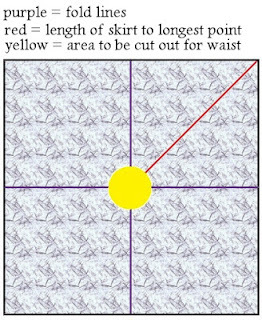 Each square will give you four points at the bottom of the skirt. Very cute and fun looking skirt! This is beautiful this is so lovely. I just made this today to update my Ren Faire costume for tomorrow, a thing I haven't done in years because I keep forgetting to. Start to finish in one evening - I spent more time hunting down the chunk of blue panne velvet I knew I had than I did sewing, I think! The description made it look easy, and for once "looked easy" actually translated to "was easy"! I definitely want to make more of these now, but I'm going to have to find more places to wear skirts, first.